Similar to tyres and brakes, clutches are main expendable components in vehicles. The service life is highly dependent on the quality, the professional fitting and the correct use of the product as well as the vehicle‘s conditions of use. The clutch is one of the elements in the drive assembly which has to sustain major strain due to the effect of vibration, pressure and centrifugal forces, and the friction heat created. The clutch forms the interface between the motor and gear box. The clutch disc is the central connection element in the clutch. 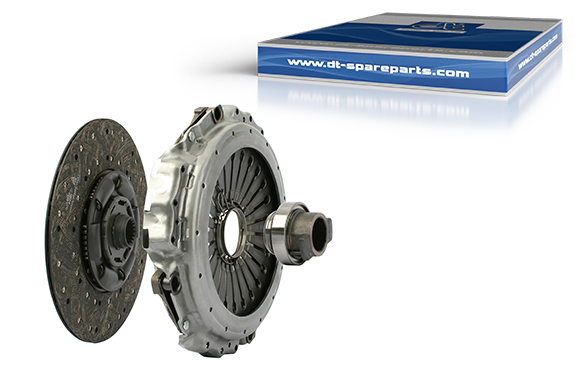 Together with the clutch cover, the clutch disc deals with separating and connecting the motor and drive assembly. In addition, it enables the vehicle to be started gently and jolt-free thanks to complex torsion absorbers. The DT® brand clutch lining is made of yarn, copper or brass wire embedded in a mixture of resin, rubber and filling material. They are produced in an environmentally friendly manner, do not contain any heavy metals and are free of asbestos. They are distinguished by the good friction properties, high strength, low weight and high resistance to wear and tear. The lining even withstands temperatures of up to 400 °C for short periods. The clutch cover forms a friction system, together with the flywheel and clutch disc, which is fixed to the flywheel with a housing screw connection. The clutch cover deals with transferring the motor torque to the gear shaft using the clutch disc. The transfer link between the clutch and control system is the clutch release bearing. It is usually centrally guided, equipped with an automatic centring mechanism and has a snap connection to the membrane spring. When the clutch rotates, the ball bearing found in the head of the clutch release bearing runs permanently, whereby a preload produced by the control system ensures that the membrane spring tongue and ring guide in the clutch release bearing run at the same speed.